Immanuel will be playing a key role in both of these gatherings. It would be great to see everyone there. But please don’t try to show up for service the morning of 10/7… you won’t be able to get there and if you did, nobody else will be there. Due to the forecasted rain, we are cancelling the Joint Outreach tomorrow (9/22). We will resume our normal schedule of first and third Saturdays next month. Don’t forget: tomorrow (9/22) from 11:00 to 1:00 we will be cooking out for our neighbors and having gospel conversations. Also, every Sunday morning from 10:00 to 10:30 AM there is a Prayer Meeting. Anyone can come join us! 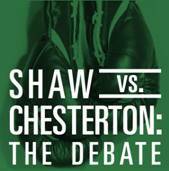 Finally, last call for Shaw vs. Chesterton. A few people are signed up to go see the 3:00 PM matinee this Sunday. It’s not too late to join them. You can buy tickets at the door. Would you like to go Shaw vs. Chesterton? Email info@immanuel-baptist.net if you’re still interested. Tomorrow (9/15) is another Joint Outreach to our neighbors who hang out behind The Meeting Place. We meet there at 11:00 AM to pray and prepare a meal. We’re usually done around 1:00 PM. It’s a great way to serve and share the gospel! Just show up! This Sunday (9/16) after the service we will be having our monthly Table Talk. This month’s topic is ‘Gender Roles’. It’s an open forum to discuss some theological topic. RSVP to info if you plan to come. It’s the first Wednesday Night Monthly Prayer Meeting of the year TONIGHT! Don’t miss it! 6:45 to 8:00 PM at The Meeting Place. Childcare provided. Daniel H. and Ryan C. are looking for a (male, Jesus-loving) roommate. They live in the Tri-Taylor neighborhood of the UIC area. Email them for more info. Sign up for one of the three nights listed below to go see “Shaw vs. Chesterton: The Debate” at info to sign-up. For more information on the show, go here.